AIVAS's plans to push the Red Star out of orbit ultimately failed, whereas its backup plan - Operation Overkill - achieved moderate success. At the end of the 9th Pass, threadfall was slashed by over 80%. In the interval that followed, holds frolicked, weyrs of old laid abandoned, and progressive new weyrholds prospered. The vast majority of the Pernese believed that Operation Overkill would kill off the remaining thread long before it ever reached Pern's atmosphere. The dragonriders, however, remained vigilant. New types of dragons were developed with Kitti Ping's data that had been rediscovered alongside AIVAS. Thread did eventually return, and while it still came less frequently, it now seemed to fall with new voraciousness and unpredictability, the likes of which the weyrs had never seen before. It became impossible to pinpoint the schedule of a fall, forcing riders to be ready for combat at a moment's notice. The importance of watchriders skyrocketed, and dragonriding came back into favor. But due to high deathrates resulting from more dangerous threadfall, holds began witholding their children once more. A contest that will decide the Junior Queen Pair is ongoing! 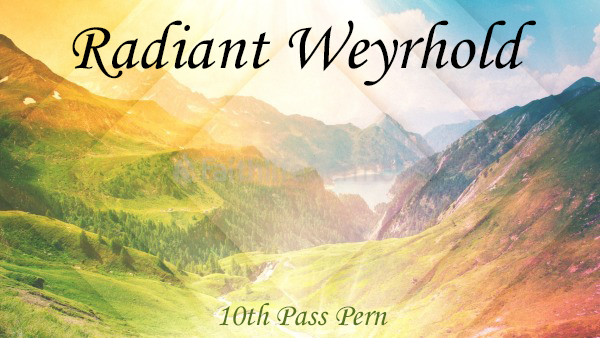 A New Turn's Gather is being held in the Weyrbowl for all members of Radiant Weyr and Hold alike. A gold firelizard clutch is hatching in the dining hall. The Senior Queen, Gold Faerith, has taken on a slight glow. She is due to rise soon! Come join us in a new weyr for the new year!